The last few years have been transformational for Saskatchewan. We have gone from being a have-not province to being a driver of the Canadian economy. Our population is at an all-time record high of 1,065,000. Thousands of people including both those who moved away and newcomers are choosing Saskatchewan as the place they want to live, work and raise their families. The credit for the work that’s made all that possible belongs to you, the people of Saskatchewan. You are responsible for creating the Saskatchewan Advantage. It is our government’s job to take action on your behalf to ensure we keep that advantage. We enjoy a quality of life rarely seen in these uncertain economic times, and it is our responsibility to ensure everyone shares in the benefits of the historic growth this province has seen. The 2012-2013 budget is balanced. It ensures spending on government services remains affordable and sustainable. This budget takes measures to ensure Saskatchewan families enjoy a high quality of life, by keeping the promises we made during the recent provincial election while providing sound fiscal management and sustainable spending. In short, it keeps our economy strong and growing. A strong and growing economy is one in which a government lives within its means. In the 2012-2013 budget, overall government spending is up less than 5 per cent, which keeps a key promise we made during the election. Even when you take into account the Crown corporations, there is a $15 million surplus and a further commitment to the Growth and Financial Security Fund of $70 million; money which can be used to deal with emergencies and unforeseen expenses, such as natural disasters. Our government recognizes that to keep our strong advantage, we need to ensure our spending is sustainable. We are calling on third parties such as health authorities, post-secondary institutions and school divisions to look for efficiencies that do not impact the services provided. As well, the Film Employment Tax Credit will be wound down, eventually saving taxpayers $8 million a year, and we will no longer fund Enterprise Regions. We also looked at what is charged to Saskatchewan people under programs such as the Seniors’ and Children’s Drug Plan to ensure such programs are sustainable. Our government feels by making these small changes we can maintain the high quality of life Saskatchewan families enjoy and ensure all people benefit from our strong and growing economy. 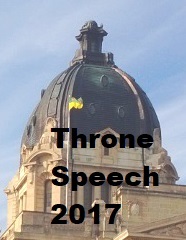 We can keep our promises to further increase benefits and programs for seniors and those with disabilities, implement the new Saskatchewan First-time Homebuyers tax credit, expand the Active Families Benefit and PST exemption on children’s clothing and establish the Saskatchewan Advantage Scholarship Program for new high school graduates. We are putting in place a new rental housing construction initiative program which provides a 10-year rebate of Corporate Income Tax equal to 10 per cent of the expected rental income from new multi-unit residential rental projects. Municipalities will receive $237 million in Municipal Revenue Sharing, an increase of $20.6 million over last year, which will allow them to provide important services for their citizens. Overall, municipalities will receive $349 million or 15 per cent more provincial funding than the year before. Healthcare is not only always the largest component of the provincial budget; it is arguably one of the most important. We understand how important your family’s health is. In the 2012-2013 Keeping the Saskatchewan Advantage Budget, funding for health authorities increases by almost $100 million and there’s a further $60.5 million commitment to the Saskatchewan Surgical Initiative to perform 8,000 more surgeries and continue reducing wait times. The Saskatchewan Cancer Agency will receive an increase of $16.9 to allow thousands of new patient referrals , chemotherapy treatments and mammograms. Under the Keeping the Saskatchewan Advantage Budget, the colorectal screening program will go province-wide to improve early detection and survival rates and there is a further $5.5 million for the STARS air ambulance. To keep the economy strong and growing, you need to ensure the necessary infrastructure is in place. The Keeping the Saskatchewan Advantage budget makes a further investment of $778 million to begin construction on seven previously announced Long-Term Care Centres, start 21 approved major school projects and inject a further $581 million into highways. The Keeping the Saskatchewan Advantage budget provides funding that will maintain and improve the quality and provide assistance for those in need. But it balances those important demands with responsibility: the responsibility to live within our means, balance the budget and ensure programs and sustainable in the long run. These are many current examples of governments around the world not living up to those responsibilities – we will not make that mistake. We will keep the budget balanced and keep government spending sustainable. We will keep the Saskatchewan Advantage.